I really wanted to make a huge Easter bunny pattern to share with you all and here it is! A good while ago I made a smaller bunny and even though I really like it, I think this one is better because she’s bigger and fluffier. A great size for a little one to take with them wherever they go, this big eared floppy bunny will make a super cool best friend. When I make stuffed animals, I tend to stuff them pretty well, so they have a good shape. I didn’t stuff the bunny too much, so that her body is still really squishy and floppy, which is better for cuddles. 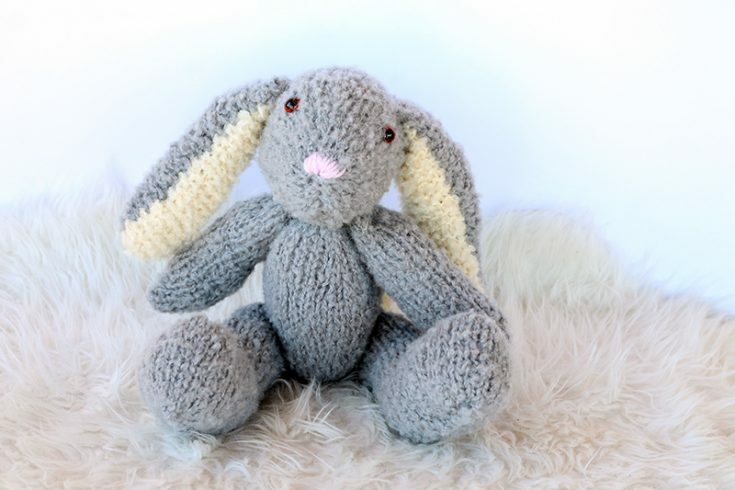 Perfect for Easter, why not make and give a knitted bunny that you know a little one will love?! 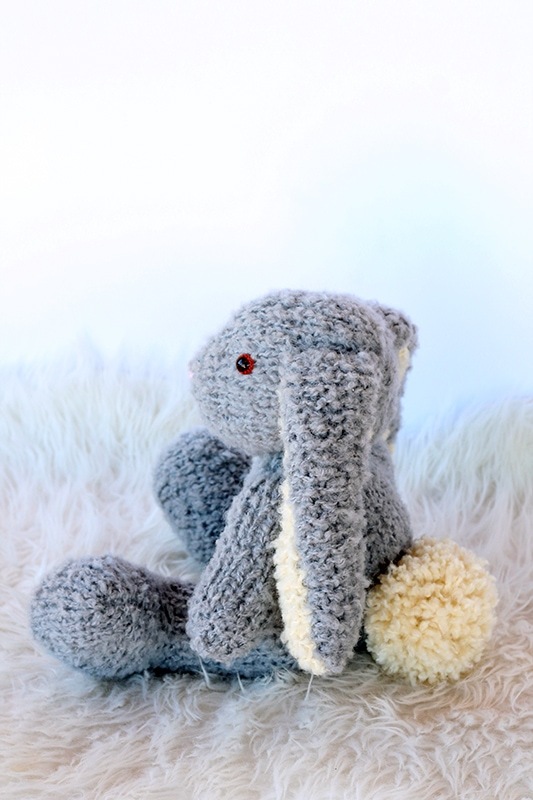 This big bunny has been knit with La Mia mohair boucle yarn in grey and cream. I used size 7mm (US 10.5) needles to knit with, even though the yarn label suggests a size 6mm (US 10) needle. 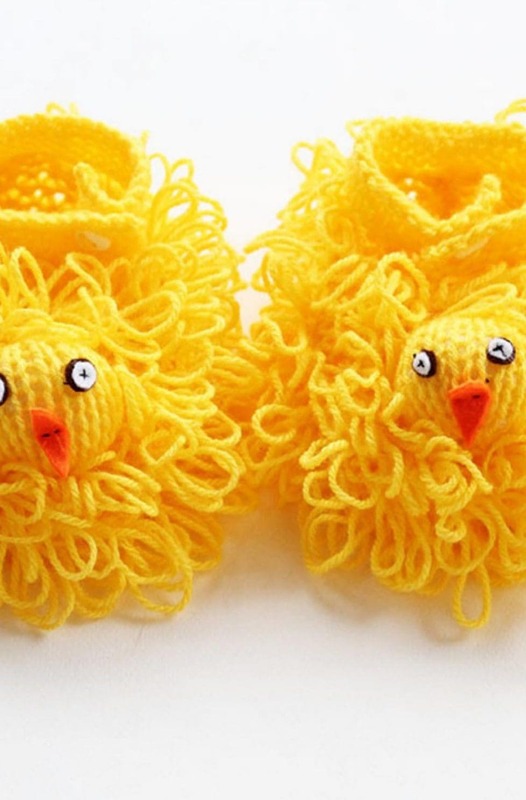 I think any fluffy yarn would be ok to use, as many brands have some sort of fluffy textured yarn in their collections. 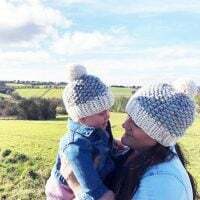 The La Mia mohair boucle yarn is quite easy to work with on slightly bigger needles than suggested, as normally with this type of yarn it can be hard to see what you are doing! 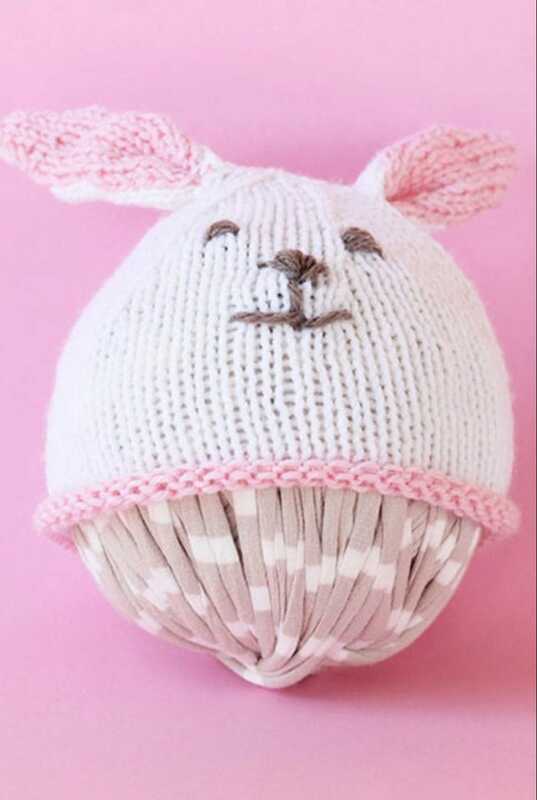 The rabbit is quite quick to knit up and stuff, so you can make one or more in time for Easter for sure. Working the rabbit up in a different yarn will still work out, but obviously different yarns give different end results. 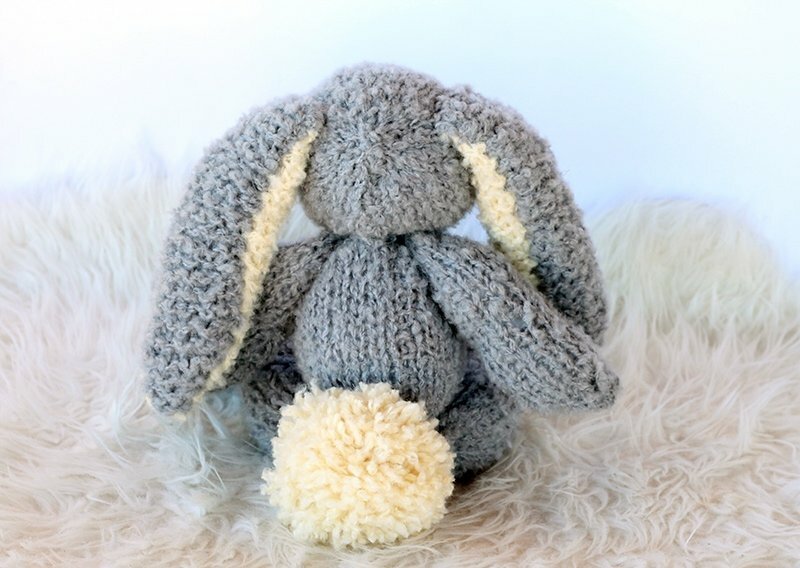 I designed the bunny pattern using the La Mia mohair boucle yarn because I had bought a couple of balls just after Christmas and I didn’t know what to do with it. The yarn is a little bit curly and that makes it really great for the texture of the fur and for the pom pom tail. 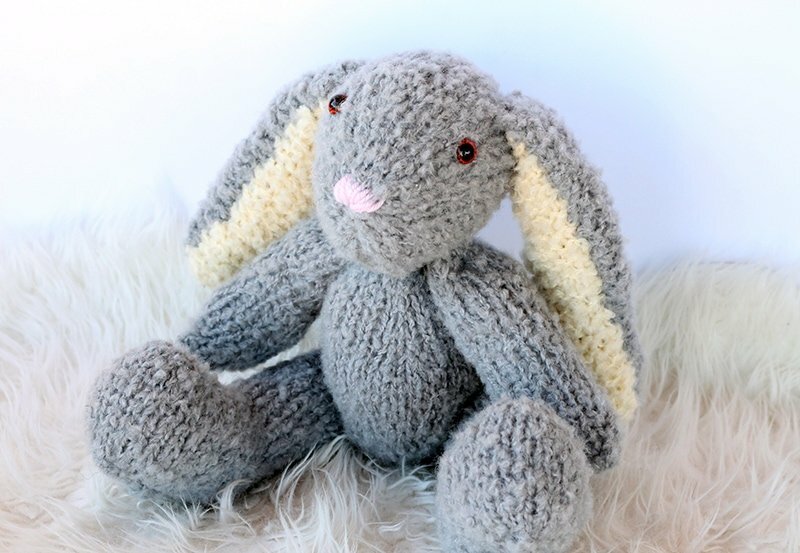 When I started to plan the bunny – I knew that each piece had to be knit flat and then seamed. Each body part has simple increases and decreases to shape. The eyes and nose on the face can be stitched or you can use toy safety eyes and stitch a pink nose. When you get to assembling your bunny, the body parts all get stitched onto the main body. I start by stitching the legs onto either side of the lower body and then the arms to the upper body. I then attach the head to the top of the body and sitch the ears onto either side of the head. Lastly, I attached the pom pom tail, this helps the bunny to sit down and balance. As for stuffing the bunny, I used a polyfill toy stuffing, not the clumpy type, as you don’t want bits here and there. The ears have an opening so you can decide if you want to stuff them or not, I didn’t because I wanted them to be floppy. 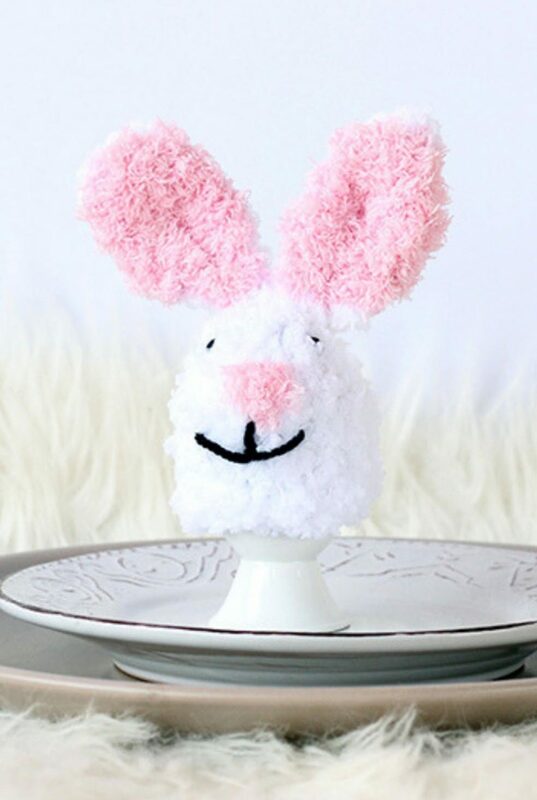 The bunny is supposed to be soft, squishy and cuddly, so don’t worry about it looking perfect or that every piece has to be stuffed to look exactly the same etc. 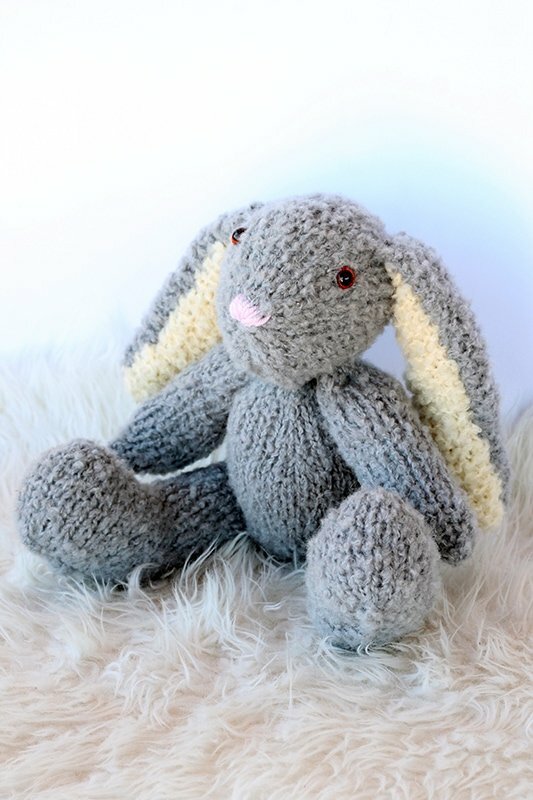 Make a big cuddly floppy bunny best friend just in time for Easter! Scraps of pink yarn (worsted or Aran) for the nose. 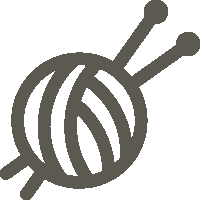 With Yarn A – Cast on 8 sts. Cut a long length of yarn and start to stitch the ear seams together (using an invisible seam). Once seamed, they will be ready to attach to the head. Thread the darning needle and push through one leg, then through again and into the body, then through the other leg and back through. Keep going until the legs are securely fastened. 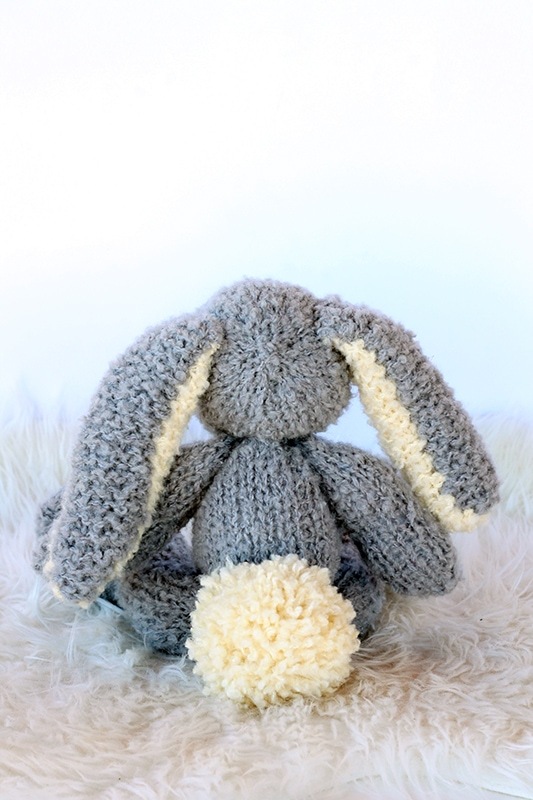 This fluffy bunny knits up quickly in boucle yarn, and the simple design makes for a relaxing and enjoyable knit. Width = 6.5 inches (body not inc arms) This may vary depending on how much stuffing you use. If you enjoyed making the floppy bunny, I’d love to see yours on Instagram, be sure to tag me @handylittleme.